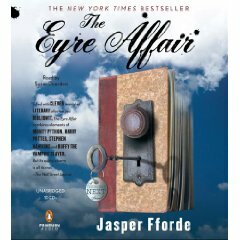 The Eyre Affair [Audiobook Review] – my books. my life. It’s 1985 in a world that reveres literature (among other differences). Someone has stolen the original Martin Chuzzlewit manuscript. It is up to Thursday Next, a Special Operative in the Literary Tech division (SO-27), to figure out who. Along the way she encounters fictional worlds, vampires, time travel, politics, family, long lost love and more. Can she do it all? The sixth Thursday Next book will be released in March (on my birthday actually) and in preparation, I wanted to go back and reread the first five books. There is a lot of stuff happening in these books and it’s easy to forget so I decided I needed a refresher. After Emily from Books, the Universe & Everything recommended the audio, I decided to give it a try. I loved the reread both because of the book itself and because of the audio production. I’d forgotten most of the plot to The Eyre Affair. I think I read it back in 2005. It was like reading it for the first time but with some characters that I already knew well. I was afraid that some of the fun and word play would be lost in the audio but it wasn’t. It was still a lot of fun. Susan Duerdan did a wonderful job with the narration. She sounded like Thursday Next to me but was able to slip into and out of the other quirky characters with ease. I do think that if it weren’t a reread, it might have been easy to get a little lost since the plot is so insane. These books are a little bit of everything: fantasy, mystery, romance, satire, science fiction, adventure, you name it. I highly recommend this series to everyone who loves books. Is this the first one in the series? I was going to read this, but didn’t realize that it was a series. Glad to know that you recommend these books so highly. Yes, this is the first one. You’d probably enjoy it even more right now since you just finished Jane Eyre (despite your dislike). I love this series. What a wonderful birthday present for you! I have been meaning to try these books for a while now and was just bemoaning the fact that I have no good audiobooks on my list. I’m going to check these out, just as soon as I tackle Jane Eyre! I’m looking forward to (finally!) starting this series once I finish the Maisie Dobbs novels. I hadn’t thought of listening on audio, but that’s a good idea too!